Good evening friends! Hoping this finds you all enjoying a beautiful day! I was recently going through the recipes I have shared with you and when I realized I hadn't shared this one, it was a MUST do. My poor husband, was so upset I was making these for him....again! Zeppole are the equivalent of like......an American "donut hole". They are fried balls of dough, which in my life, is pizza dough! You can buy pizza dough or you can use my recipe, which I have deemed the best ever. Click here for that recipe. These are very simple. After you fry them you can toss them in powdered sugar, regular sugar, cinnamon sugar, etc. The options are limitless. I filled half of mine on this batch with pastry cream! You can find that recipe here. You could also use vanilla instant pudding or whipped cream to fill these. I don't usually fill mine but I was hungry for this version, thus doing half. 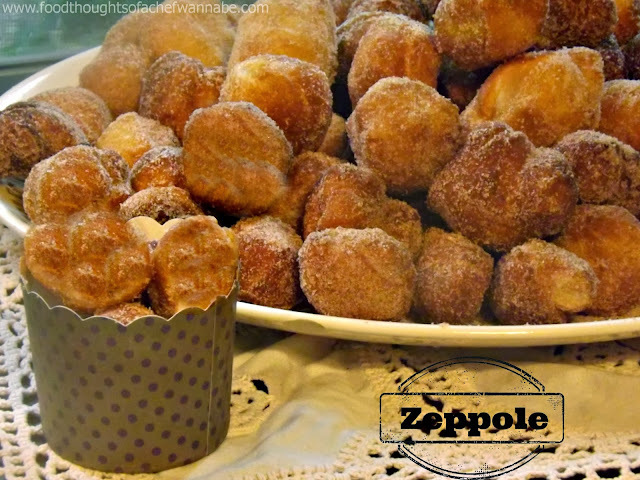 Let's get started on these quick and easy zeppole! Prepare a cooking sheet or large platter, by lining it with paper towels. In a medium bowl, combine sugar and cinnamon. Set aside. Get 4 inches of oil into a pot. Bring up to 350 degrees F. While that is heating up, using a pizza cutter for ease, cut the flattened out dough ball into strips. Then cut small pieces from those strips, like this. Don't cut them TO big, they will blow up in size when you fry them! Take each piece and just quickly roll into a ball. This is optional but I always do it. Do this with the entire ball of dough. When the oil is ready, drop in a few at at time. They won't take long, and when they are golden brown they are ready! Remove and place on paper towel lined platter. Take them and immediately toss them in your cinnamon sugar mixture. Toss to coat and transfer to a serving platter. Let cool for 5 minutes before filling, IF you are filling them. Otherwise, dive in, these are best when they are still warm! Enjoy your zeppole, I know we did!